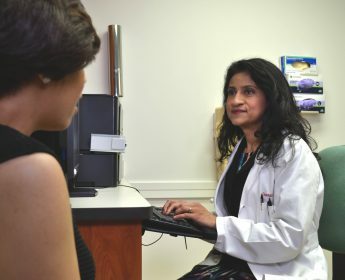 Physicians will have access UpToDate®—an online, evidence-based clinical decision support resource—during Internal Medicine and Nephrology Knowledge Check-Ins and part of the Internal Medicine and Nephrology traditional Maintenance of Certification (MOC) exams administered in the spring. In the fall, physicians will be able to access UpToDate for the entire Internal Medicine and Nephrology MOC exams, and it will also become available for all other MOC exams for part of the exam. ABIM previously announced that physicians taking the Knowledge Check-In in 2018—the initial year it is offered in Internal Medicine or Nephrology—would have another chance to take it again two years later if they were unsuccessful, even if they were due to pass the exam that year. This policy has been extended to include all other Internal Medicine subspecialties in the future. This means that if a physician takes the Knowledge Check-In the first year it is offered in their subspecialty and is unsuccessful, they will get at least one additional opportunity to take and pass it two years later. ABIM’s governance structure consists of more than 350 members on more than 50 boards and committees and includes physicians, allied professionals and public members. Specialty Boards work to provide discipline-specific oversight for ABIM’s Certification and MOC programs. Define, refine and set standards in Certification and MOC in the discipline. Perform oversight/review of performance assessments in the discipline. Build partnerships with societies and other organizational stakeholders in support of ABIM work. Specialty Boards will meet throughout the spring to talk about the unique needs of their communities, and about enhancing the relevance and value of ABIM programs. Several Boards will vote on new members or announce new Chairs for the upcoming academic year beginning July 1, 2018. ABIM staff and leadership will be present at a number of annual society meetings, answering questions in exhibition halls and hosting focus groups and informal meet-ups to gather physician input on the future of the MOC program. Not attending a society meeting? 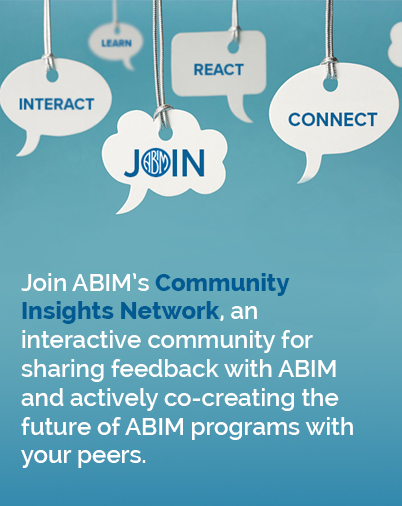 Please consider joining our Community Insights Network, an interactive community for sharing feedback with ABIM and actively co-creating the future of ABIM programs with your peers.